Yesterday's goal was to prepare a quilt back for the HST Overload Quilt top, as well as prepare the batting (soaking - extracting - tumble drying), and then baste the quilt sandwich. (You can read more about batting and basting here in this previous post). These tasks were finally accomplished after much procrastination. Today I am sporting a bruise on my knee from basting - crawling around on the floor has its hazards - and sore fingers from all those pins. I have started quilting and am pleased with the progress and how well the quilt sandwich has basted. No shifting, no puckering. As much as I dislike the basting process, I take comfort from the fact that the pin basting method delivers good results every time. Changing basting methods now that I've got it down pat is just plain scary! I'm loving that quilt! I have plans to make one of these soon, so I'm interested to see how you finish yours. I've been pleased with my switch to spray basting - I'm having really good results - but I completely understand your desire to stay with what works for you! It looks great! And you know that pin basting works. There is a saying "when it ain't broke, don't fix it". Can't wait to see the finished quilt! I use a lot of pins also - maybe more than I need - but I figure what the heck it will hold it in place much better. Thanks for posting your link to your basting post. I'm currently machine quilting my first quilt and boy did I learn my lesson about bad basting! I have carpet throughout most of my house and a cat and dog, so I used a sheet between my quilt backing and carpet. 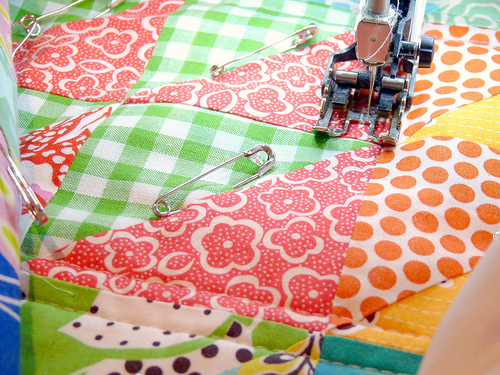 Unfortunately I've had to repin halfway through my quilting and the back is pucker-city. Next time I'll use your method of using tape tape tape to a taut back--and maybe even mop my little hard surface instead of messing with the carpet. By the way, I'm a newbie here but have loved your posts. Your quilting is truly beautiful. I use lots of pins also. I got a quilting frame a few months ago thinking that I'll use it but I am so used to basting with pins and quilting the 3 layers together like you that I don't know if I'll ever use the frame. BTW, can't wait to see the finished quilt :). Wow! I love this quilt! 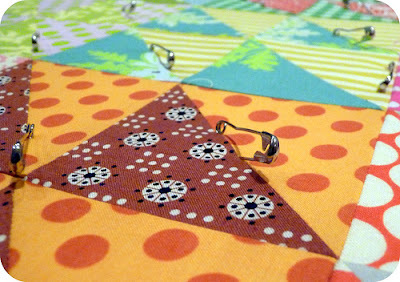 I went back to your post and see how you made the squares but I don't know how to sew them together diagonally like that. I hate to ask but if you ever do another one could you show how you did that. Thanks for always inspiring me! I'd say stick with it if it works. your quilting is awesome. love the foot--mind telling us what it is? I love that quilt more than any quilt I've seen in a long time! Thanks for sharing. I like the pin basting method too but because my basting area is carpeted, I slide my largest cutting mat under the backing and move it around while I pin. I've been known to rent the floor at my mom's house for bigger quilts! NNNOOO don't do it. Tried the spray baste once and the quilt is still hanging in my sewing room waiting to be finished quilting.. lots of %$##@ going on from gummed up needles though someone has suggested dipping needle in silicone stuff or teflon needles (which I am now in possession of) so when I get a minute I will have another go. Pin Basting RULES I heavily echo quilt and never have a problem. I just got done basting a very very large queen quilt and my knees aren't very happy with me but even so, I won't use the spray! The quilt looks amazing... so lovely to see it up close! Have you heard of the Kwik Klip? I couldn't do my pin basting without it. Cuts out tonnes of time and really saves your fingers. Not even that expensive as far as gadgets goes. I sure hate pinning the quilt together. But I'm also very leery of the spray adhesive...Can't want to see this quilt when it's done! I use Sharon Schamber's method of basting on a table with two boards. It's great. I've had to tweak it a little because with a big quilt top it isn't as easy at it looks in her video with a small piece of fabric but it works well. This is going to be a really lovely quilt. I suspect the person who invented Pilates did so after an afternoon spent basting a quilt on a hardwood floor. i think i'm too lazy for the basting with pins method. When I did do it, I didn't do it well enough, and my quilt looked like crap. I use the spray stuff, and it works out quite nicely. The spray washes out (and I always wash my finished quilts). But getting it all straight before basting is a pain in the patooty! I have the same question as a previous commenter...How do you set the HST on a diagonal like that? I am a newbie and am doing pretty well making the HST but can't figure out how to set them on a diagonal. Yikes, such perfect intersections my hands have never made. Excellant! It would be great if you could join and/or post more of your patterns there so more people could see your talent!